Happy October! Is it just me or is this year completely flying by? 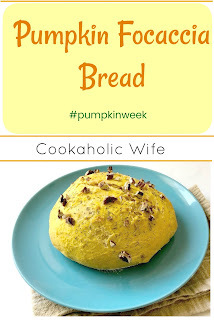 But now that it’s October, it’s time for me to participate in a new blogging event called #PumpkinWeek. It’s hosted by Terri of Love and Confections and pretty simple: 35 bloggers are gathering this week to share pumpkin related recipes with you. They’re all linked up at the bottom of each post every day. For the first day of #PumpkinWeek, I decided I wanted to go savory. It’s fascinating to me how many recipes you can include canned pumpkin in. Or how many recipes where you can use it as a substitute for another ingredient. Anyway, I haven’t made focaccia bread in ages and I decided that it was the perfect choice to start off the week of all things pumpkin related! 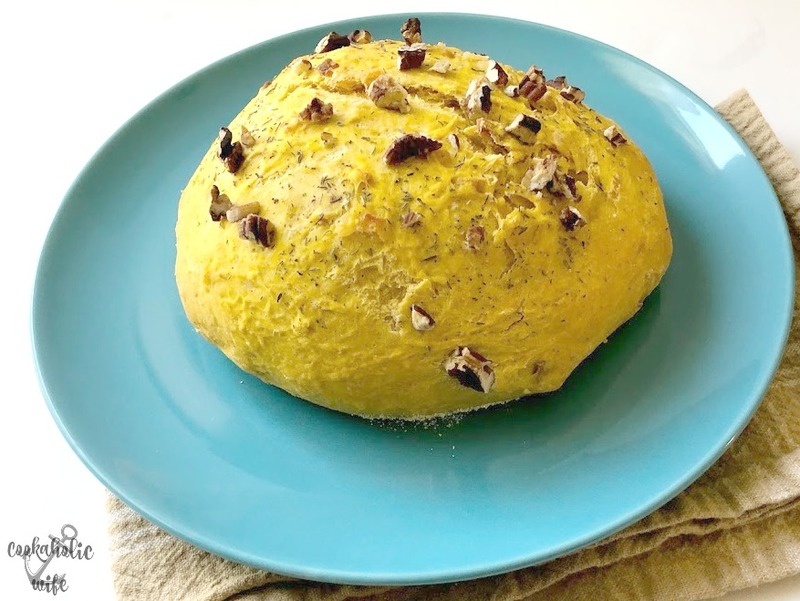 Pumpkin Focaccia Bread is savory pumpkin bread topped with toasted pecans and smoked gouda cheese. 1. Combine yeast, sugar and water in the bowl of your stand mixer and set aside for 5 minutes or until yeast is foamy. Then add the butter and 1 cup of flour, mixing with the paddle attachment until combined. 2. Cover and let rise for 30 minutes in a warm place. 3. Add pumpkin pie spice, salt and canned pumpkin to the bowl and stir until combined. Switch to the dough hook and add in ½ cup of the cheese and the flour ½ cup at a time, leaving 1/4 cup remaining. Mix on low speed until combined and then increase until the dough begins to pull away from the bowl. 4. Turn out the dough onto a lightly floured surface and knead until smooth and elastic, adding in the remaining ¼ cup of flour as needed. 5. Spray a bowl with non-stick spray and place the dough inside, turning once to coat. Cover with a towel and let rise for 1 hour or until doubled. 6. Punch down the dough, then let rest for 5 minutes. Divide dough in half and shape each piece into an 8-inch round circle. 7. Sprinkle the cornmeal onto a large baking sheet and place each dough circle on top. 8. Sprinkle the remaining cheese and the toasted pecans on top. Sprinkle the time and the sea salt on top as well. Cover and let rise for 20 more minutes. 9. Preheat the oven to 400 degrees. Bake the dough uncovered for 30-35 minutes or until the bottoms are lightly golden brown. Transfer to a wire rack to continue cooling then slice and serve. 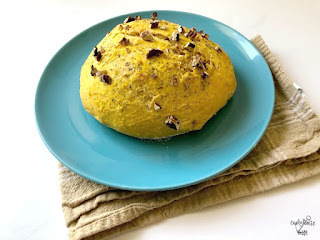 This bread is light and airy with a hint of pumpkin flavor and made super delicious with the smokey cheese and crunchy toasted pecans. I love adding pumpkin puree to my breads. Thanks for sharing this recipe Nichole. Yum I've only made focaccia once but I think this will have to be my second!